Posted on March 3, 2017 | 1484 views | Topic : News & Articles, Property News. THOSE who are looking for their dream homes should take advantage of the current low bank interest rate for housing loan. Zeon Properties Sdn Bhd chief executive officer Leon Lee said the interest rate was hovering at 4.5%, compared to 12% when housing loan interest peaked in 1997. “The interest is still low enough to make property investment an attractive venture. “House buyers, especially the first-timers, should grab such opportunity if they come across properties of their choice,” he said. Zeon Properties is marketing the RM800mil City of Dreams during the Starproperty.my Fair 2017 at Aman Central Mall, Alor Setar, Kedah. The four-day event ends on Sunday. Lee said property prices in Penang had remained stable although there was a slowdown in property market. “Property prices have either remained unchanged, or increased slightly compared to a year ago. “It is worthwhile for eligible investors to take a loan to invest in Penang properties,” he said. Runnymede Group corporate communications head Shazlyn Holdaway said there was a strong market in Alor Setar for high-end properties in Penang. Citing an example, she said their Triuni Residences @ The Sanctuary, had received good response from the visitors. She said Runnymede was also showcasing the RM120mil Vilaris Courtyard Homes @ The Sanctuary, which was 80% sold and had received the certificate of completion and compliance. 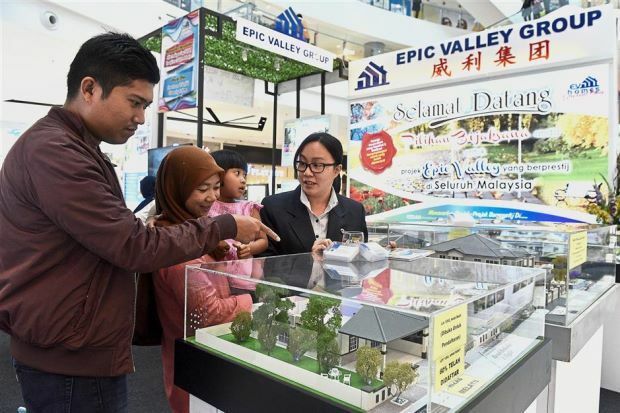 Epic Valley Holdings Sdn Bhd assistant general manager (marketing) Ong Ai Ping said the group was showcasing properties priced from RM140,000 to RM658,000. “We are promoting 700 properties from more than 12 projects in Kedah. “Nowadays, it takes six to 18 months to sell a project, compared to six months in the past, following the slowdown in 2014,” she said. BDB Land Sdn Bhd sales executive Foo Chee Lim said the group expected strong enquiries for BDB’s projects in Jitra and Sungai Petani. He said they were showcasing landed properties in Taman Tunku Intan Safinaz, Jitra, during the fair. He said the single-storey semi-detached, two-storey semi-detached and two-storey terraced houses in the project were sold out. “We have only the two-storey bungalows left. Each unit is priced from RM750,000 onwards,” he said. Some 60,000 visitors are expected to throng the four-day event which opened yesterday. Aman Central Mall centre manager Simon Ho said the crowd is usually stronger in the weekend. “This is especially true when there is a fair going on,” he said. The participating developers are Ewein Zenith Sdn Bhd (RM800mil in Gross Development Value), BDB Land Sdn Bhd (GDV RM20.9mil), Epic Valley Holdings Sdn Bhd (GDV RM124mil) and Runnymede Group (GDV RM620mil). Meanwhile, East West Horizon Plantation Berhad is promoting its oil palm plantation investment schemes at the fair. The company has a gross land bank of 11,670 acres (4722.68ha) of oil palm plantation in Sabah. The public-listed company is principally involved in the oil palm plantation business, particularly in development and management of oil palm plantations. The company is approved by Companies Commission of Malaysia as an investment scheme under the Companies Act, 1965. The fair will be held from 10am to 10pm daily until Sunday. There will be a Spin & Win Contest offering special prizes such as the Samsung Galaxy Tab 8.0 with S-pen, Samsung Galaxy Tab A 7.0, and Samsung Galaxy J7 Prime for the lucky winners. There are also seven Parkson vouchers worth RM100 each to be won daily from the contest.